In addition to the delicious food that we were planning to try in Lisbon, there were many other foods that we were given the opportunity to order and I’m so glad we did. It’s fair to say that we did not have a bad or even average meal in Lisbon. I would even venture to say that all of the meals were closer to excellent (especially all three of our dinners). We tried to order appetizers, main dishes, and desserts as often as possible in order to take full advantage of of our meals in Lisbon. So, it’s understandable that we have several great dishes to share! 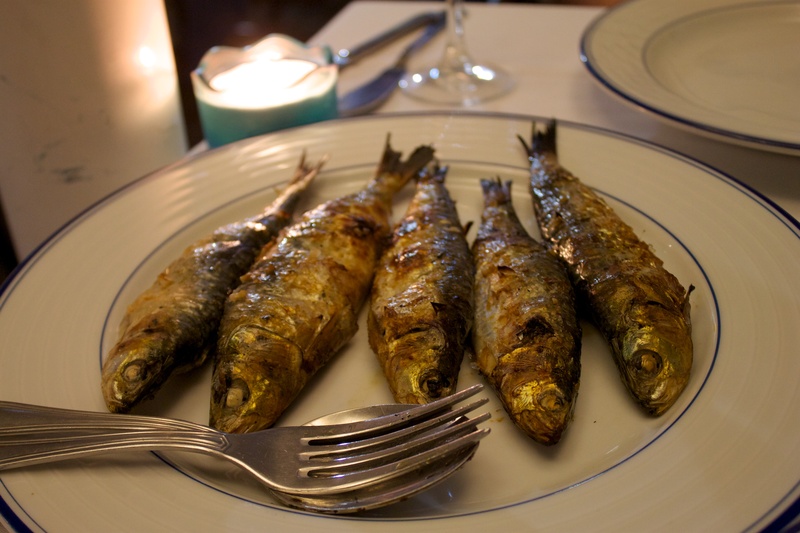 We shared two appetizers that I keep dreaming about – grilled sardines and fried green beans. We ordered grilled sardines on our second night in Lisbon. If it’s not obvious yet, we both love seafood. We saw a grilled sardine dish as a special of the night, but since we had already decided on our entrées, we asked if it could be an appetizer instead (it came with sides as an entrée). I’m so glad we ordered this – five whole sardines, complete with bones, tails, and heads! The aroma of the freshly grilled sardines hit us right away, and we could not try them quickly enough. The crispy, salty skin and the fresh fish inside was perfect – there was nothing to distract us from the wonderful taste of the sardines. We ate as much of each sardine as we could, starting with the head and going down to the middle of the tail. After finishing, Ryan wished he had ordered it as his entrée, and I don’t blame him! 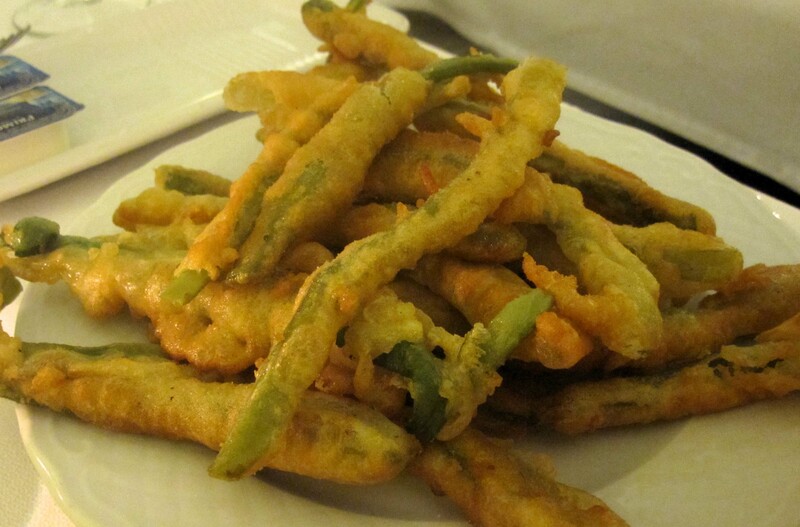 We were torn on which appetizer to order on our last night in Lisbon (at the Fado restaurant), but our waiter recommended the fried green beans, so we went with that. Although a little disappointed that a seafood appetizer was not recommended to us, our anticipation grew as the plate of green beans was placed in front of us. They were still hot and crispy. They were surprisingly light, and not oily or greasy like most fried foods. The green beans themselves retained their flavor and were not dried out at all. Another excellent choice. We noticed that every single table also ordered the green beans, so they must be a house specialty (try them if you go to Guarda-Mor!). I wish we would have ordered a second helping! I mentioned before that our favorite meal in Lisbon was at Sea Me. My dish was a mix of all different types of seafood plus pasta, which are two of my favorite foods. Sea bass stuffed with prosciutto & mozzarella and linguini di mare – delicious. The linguini was full of baby clams and the sea bass was oozing with melted mozzarella. It was a generous size and I had no problem finishing the entire thing. The only non-seafood entrée ordered in Lisbon was Ryan’s dish at the Fado restaurant. It was a special that night: chicken stuffed with Portuguese sausage served with potatoes and spinach. The meat was tender and I thought I could taste a bacon flavor around the outside of the chicken. Whatever it was, it was a huge hit! Chocolate cake was on every menu we viewed, possibly because it pairs so well with Port?! While all three of the cakes we tasted were wonderful, the dessert from Sea Me….takes the cake! The bartender instantly recommended this cake to us when we mentioned the words “dessert” and “Port.” He said it was so delicious and intricate that he could not even explain it in English. We trusted him, and I am so glad we did! The crust was chocolate, the middle was mousse-like and rich, and warm chocolate sauce was drizzled on top with a sprinkle of peanuts. While we had heard of the Pastéis de Belém, we had not heard of the bolo de arroz (rice muffin), which are made with rice flour. The owner of our B&B brought them one morning and gave them to us at breakfast. The top was crispy with sugar, but the instead was soft and fluffy. It was perfect as a late morning snack! The food in Lisbon met and then surpassed our expectations. We can’t wait to return and try some of the foods we loved on our trip, and some new local favorites. This entry was posted in Food, Travel and tagged food, Lisbon, Portugal, Portugal/Spain 2012 Trip by Kristin. Bookmark the permalink.